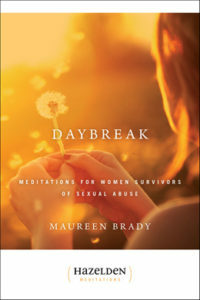 [by Maureen Brady; Hazelden – 1991] These 366 daily affirmations and meditations extend support and wisdom to women who have survived childhood sexual abuse. With understanding, compassion, and strength, the author addresses issues such as intimacy, fear, play, sharing secrets, and anger. She also shares her personal knowledge of sexual abuse to illustrate that we can not only survive, but thrive.